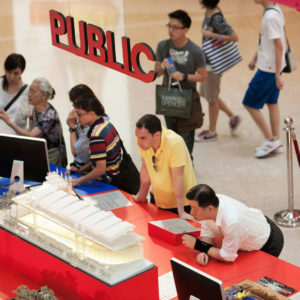 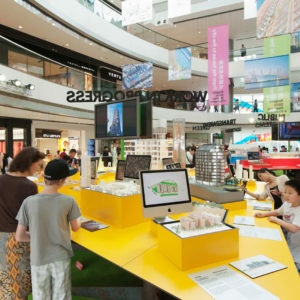 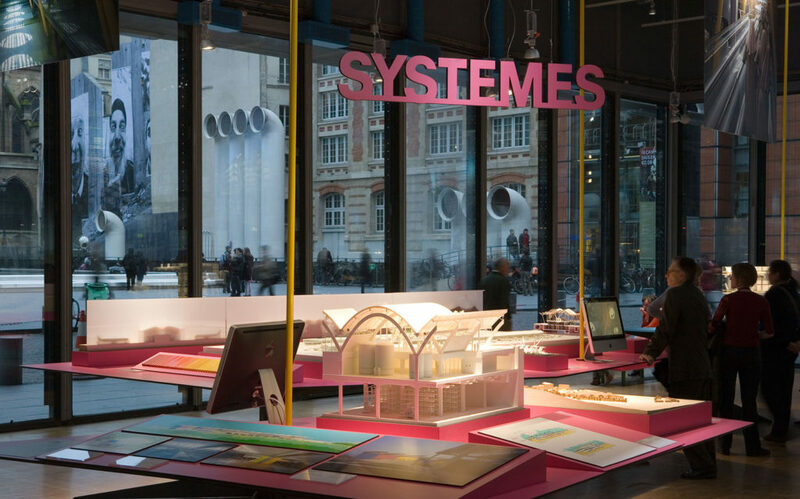 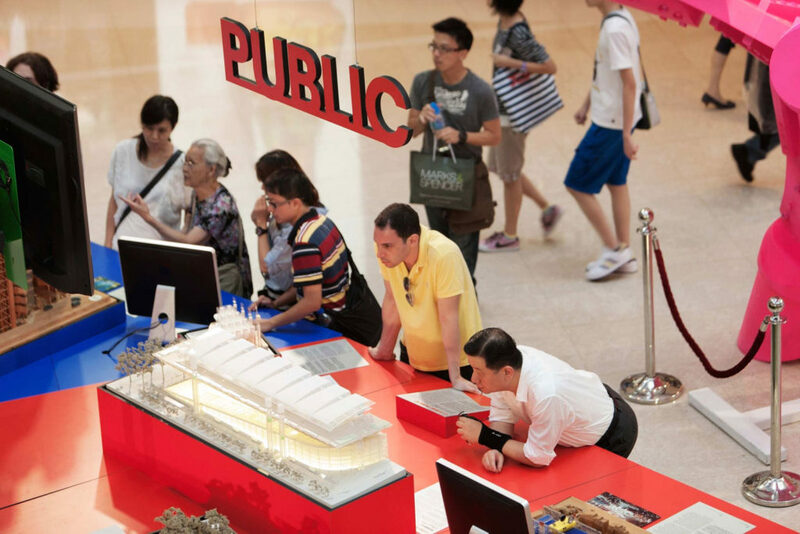 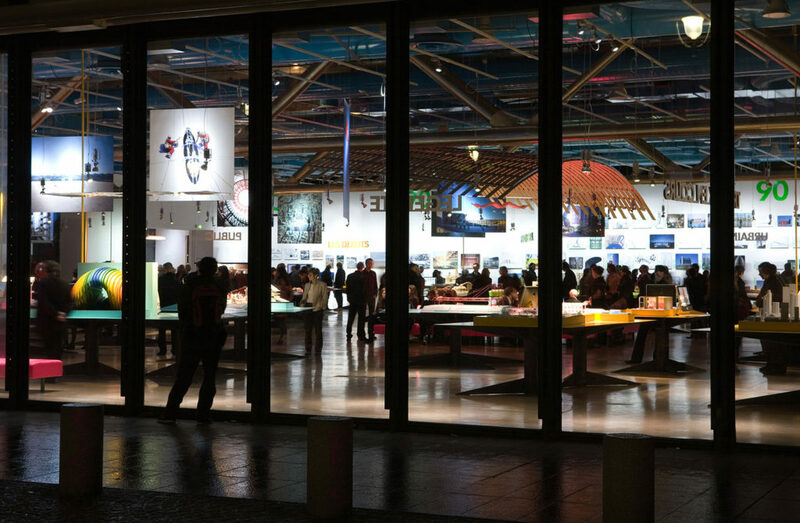 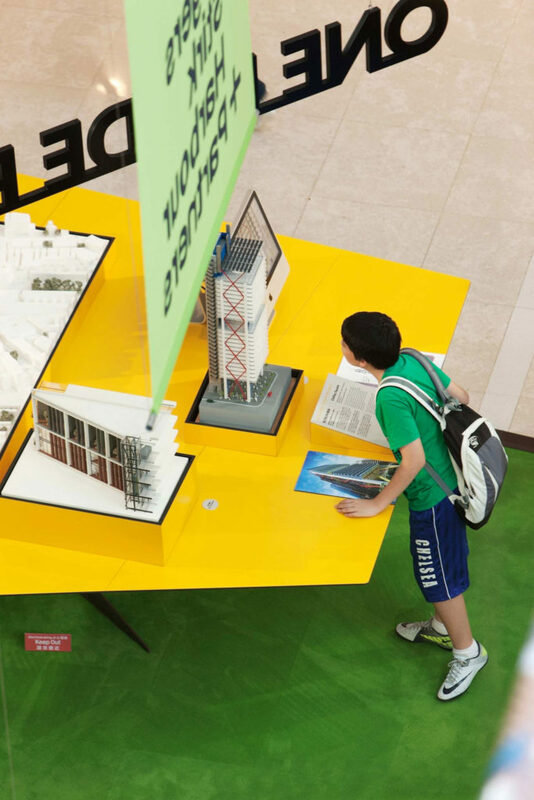 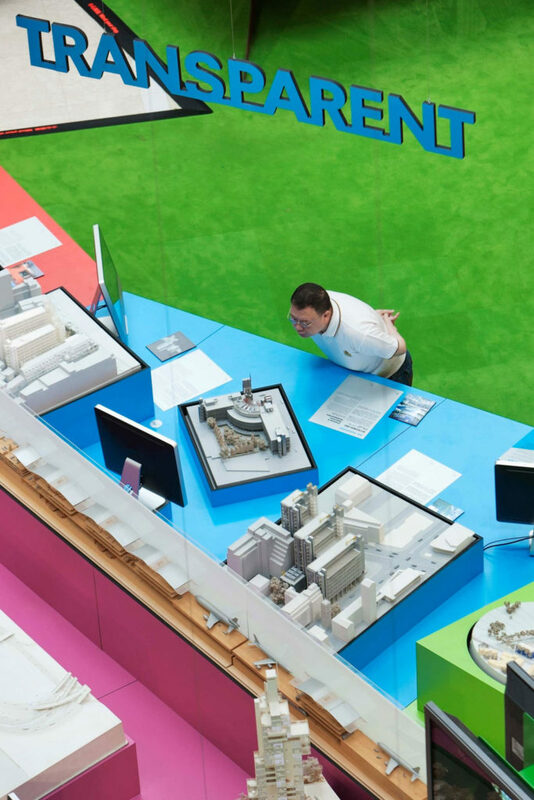 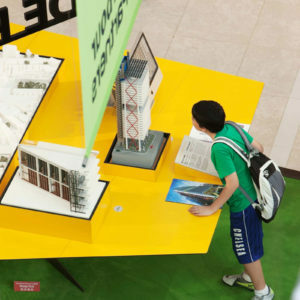 Brief: Design an exhibition exploring 45 years of RSHP’s architectural projects through display of models, photography, drawings, films and digital animations. 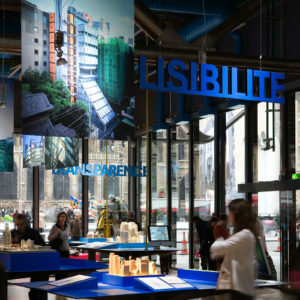 Curation of the exhibition content took a thematic approach, organizing display material by the key themes underpinning the projects on show: Legibility, Systems, Transparency, Green, Public, Urban and Work in Progress. 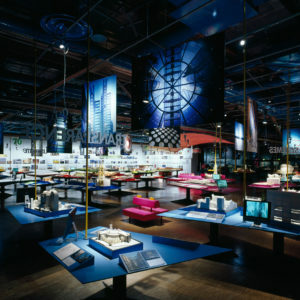 A pictorial timeline, spanning projects from the 60s to the present, was conceived to run in parallel with this conceptual exploration, forming the back-bone of the installation. 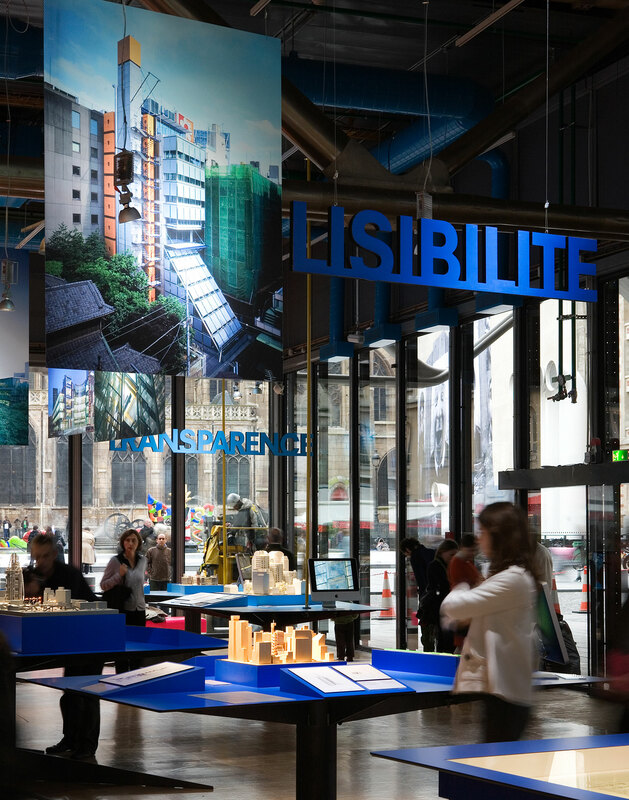 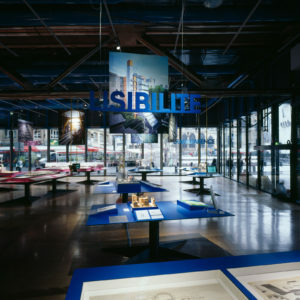 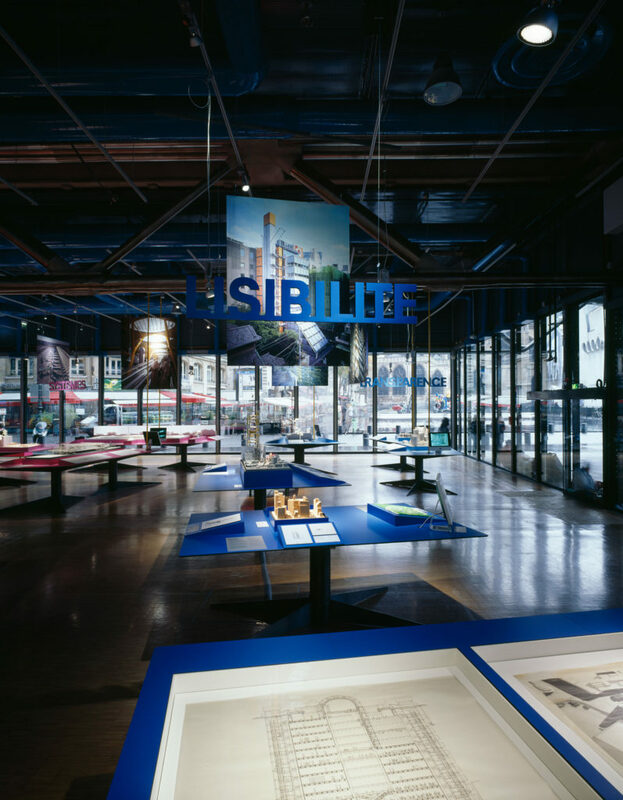 To create a legible display language that would physically structure and organize this approach, our design took inspiration from the city, forming a network of streets, landmarks and piazzas out of the exhibition content via clusters of cantilevered steel display tables in vibrant colours. 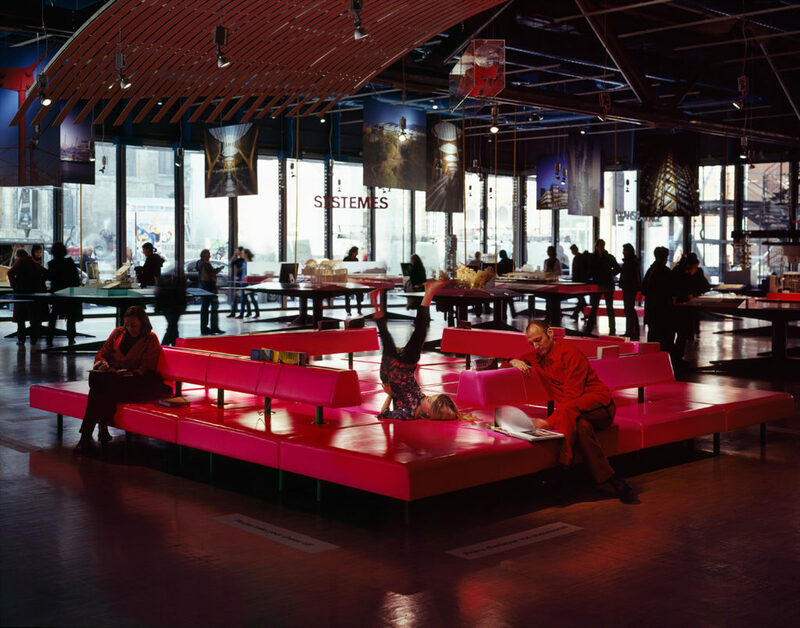 The fine planes of these tables were designed to display a quantity of drawings, models, screens, material samples and text, their colours corresponding to the zones identified in the curatorial brief and further highlighted by high-level signage to aid navigation. 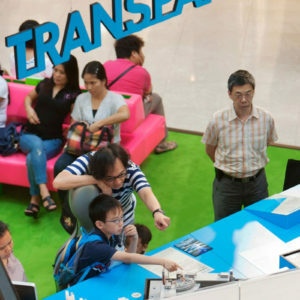 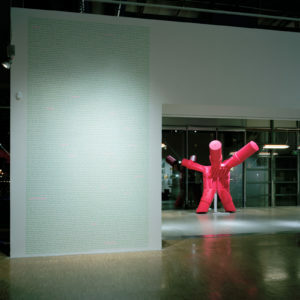 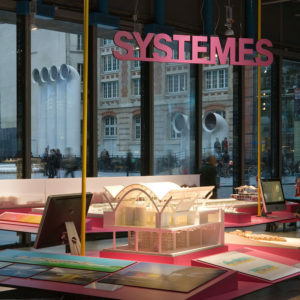 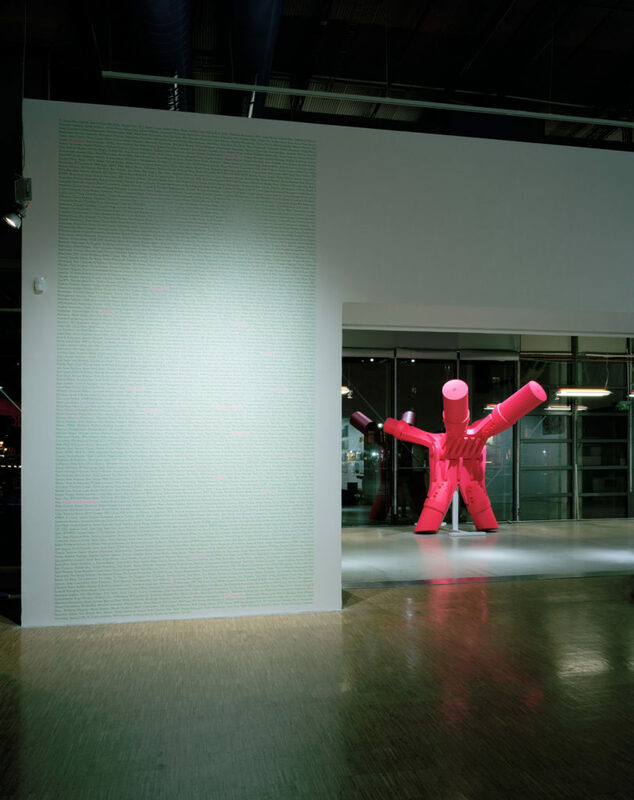 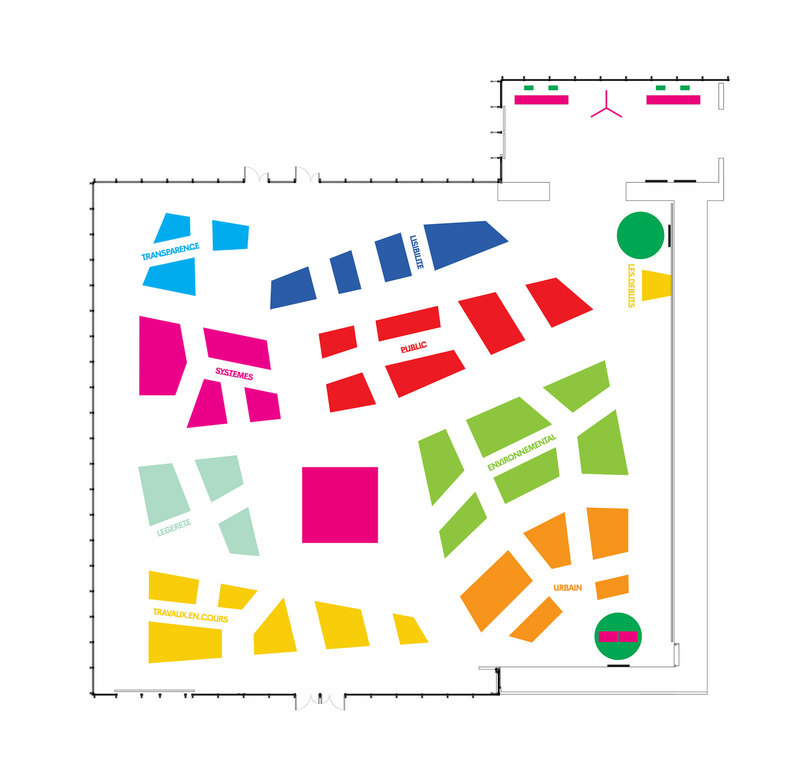 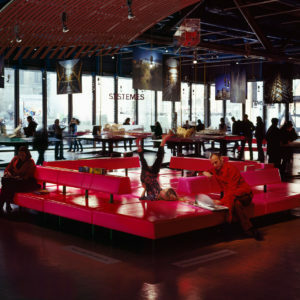 We avoided use of traditional display cases, wanting the visitor to be able to connect intimately with what they were seeing and we kept the layout open plan, allowing free circulation throughout and placing a vibrant pink soft piazza in the centre of the show to create a generous social hub where people could gather to sit, relax, read, discuss, learn and play. 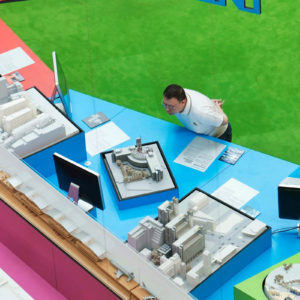 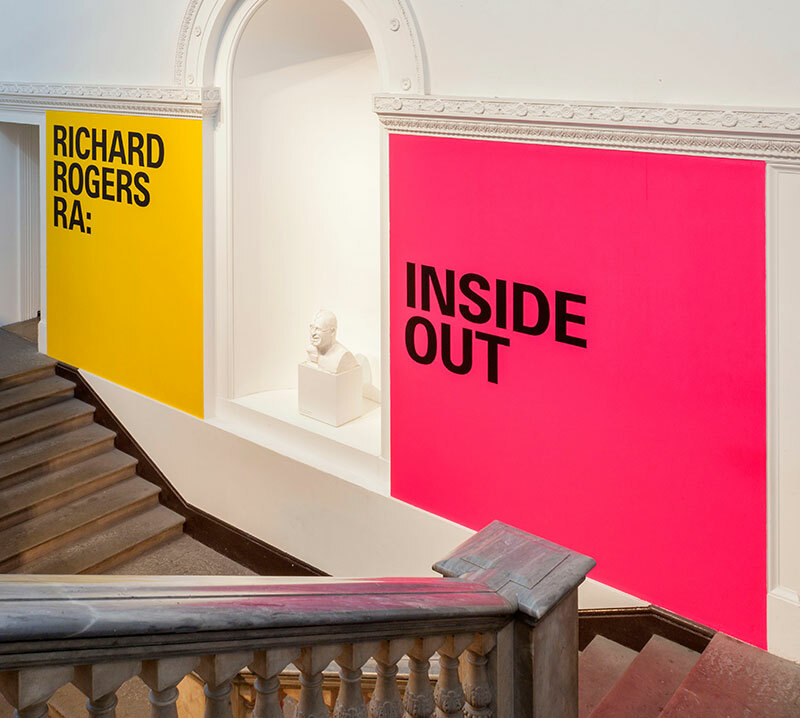 To ensure that the exhibition held universal appeal – new models, visuals, reports, interactives and films were commissioned in support of the projects to unpack the themes for a wide range of visitors. 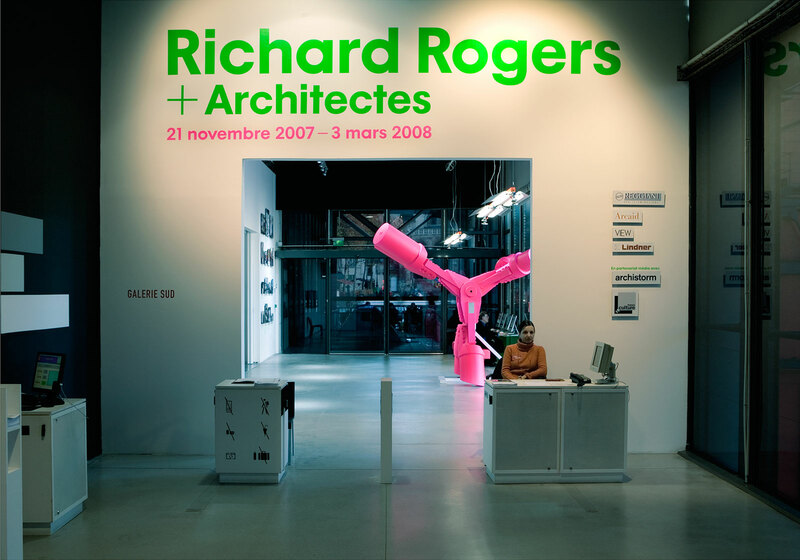 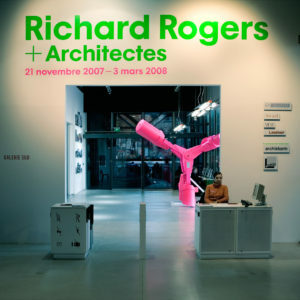 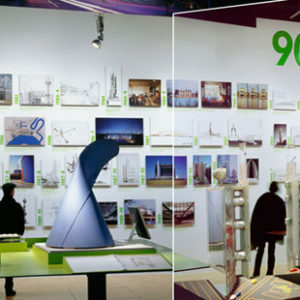 To give the landscape of the exhibition variety and texture, a series of life-size architectural elements and prototypes – nodes, beams and roofing systems – were placed throughout the space like sculptures, to give visitors a sense of their true craftsmanship, scale and power. 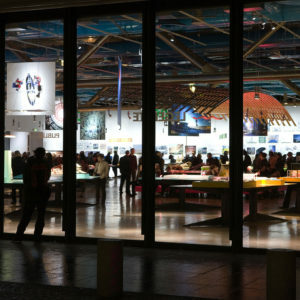 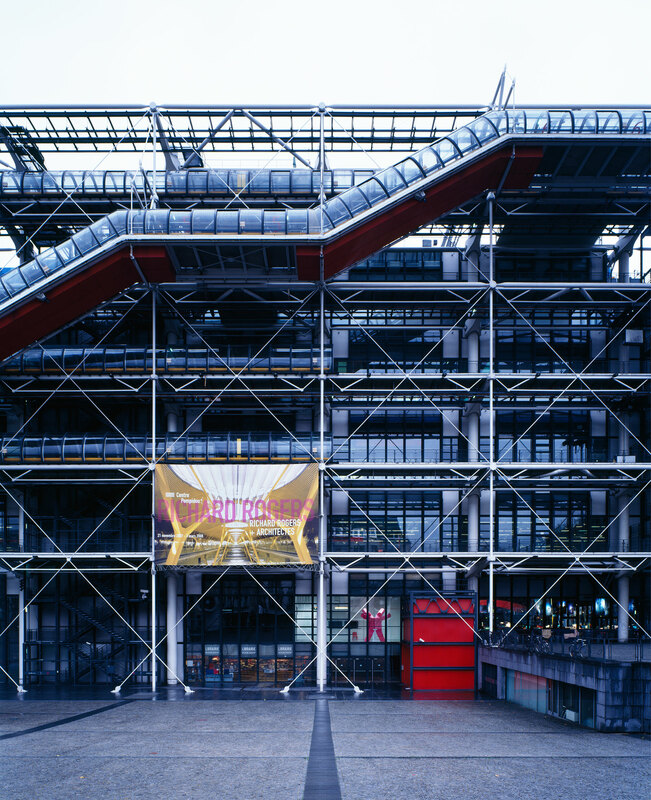 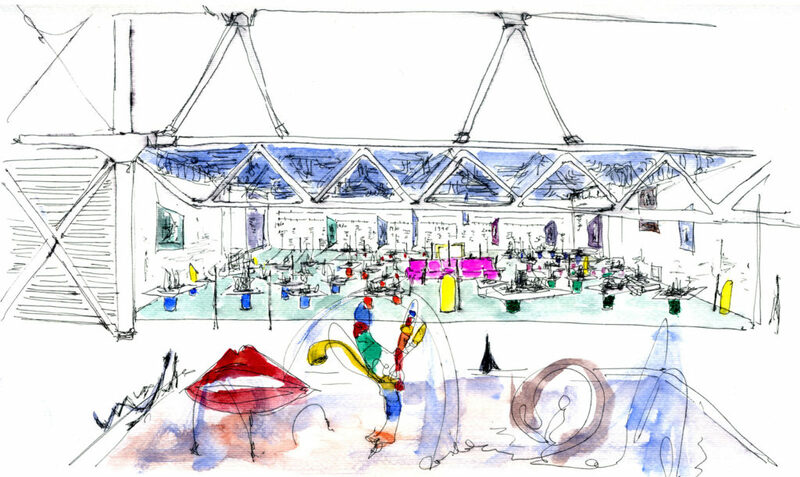 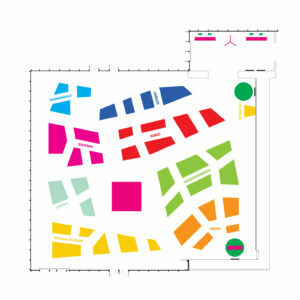 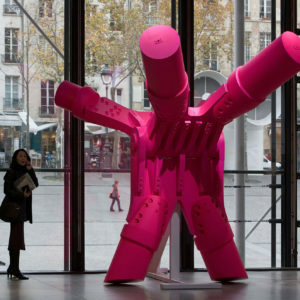 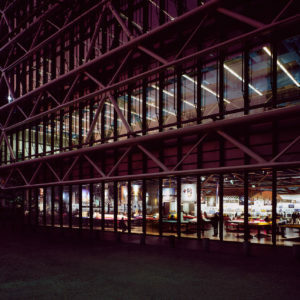 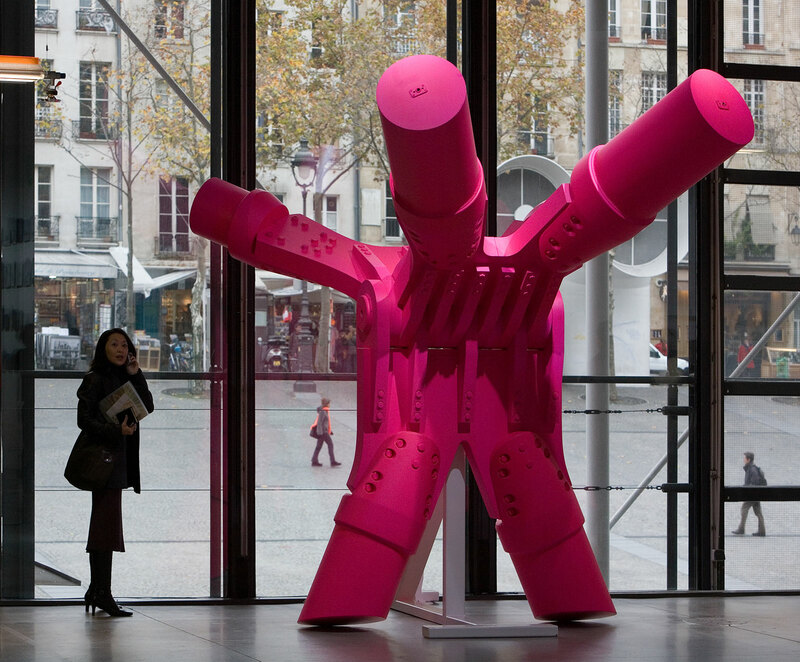 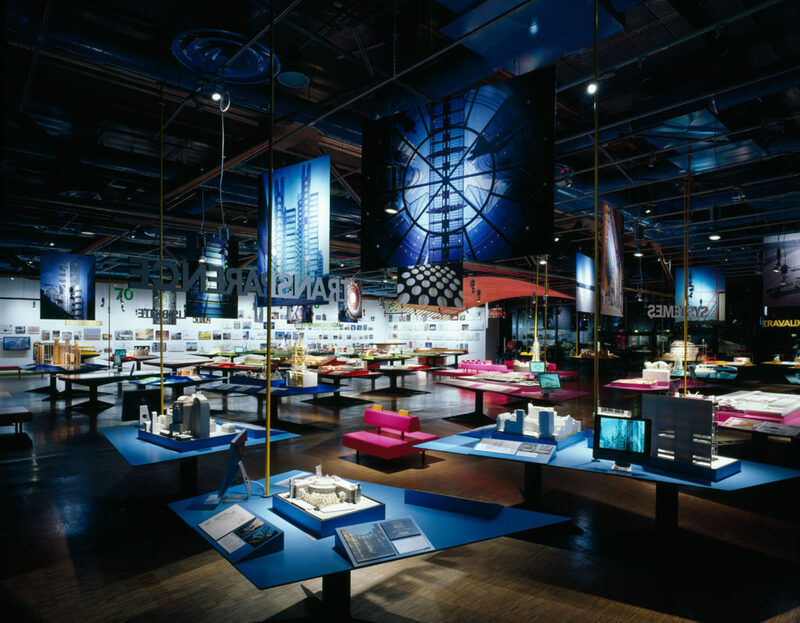 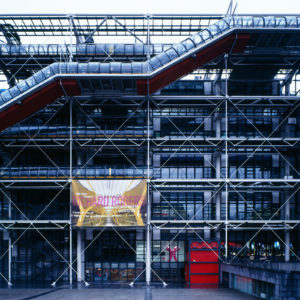 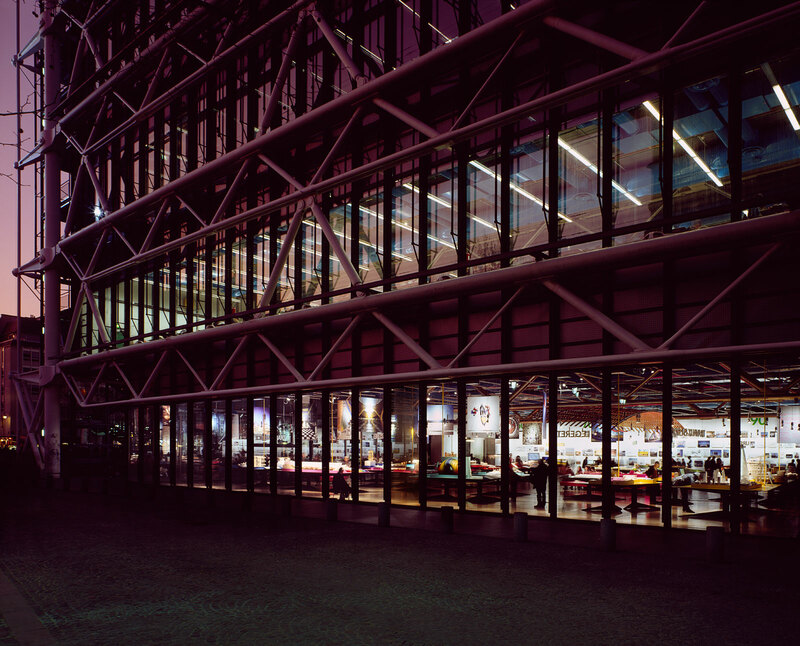 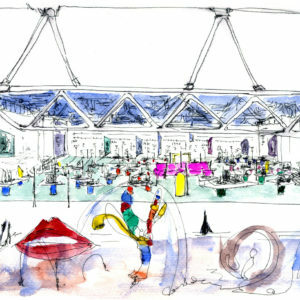 Originally conceived for the clear span of Pompidou’s Halle Sud, the exhibition went on to travel to a further seven venues across the world, ranging from purpose built and converted historical factory gallery spaces, to civic office and 24-hour shopping mall atria. 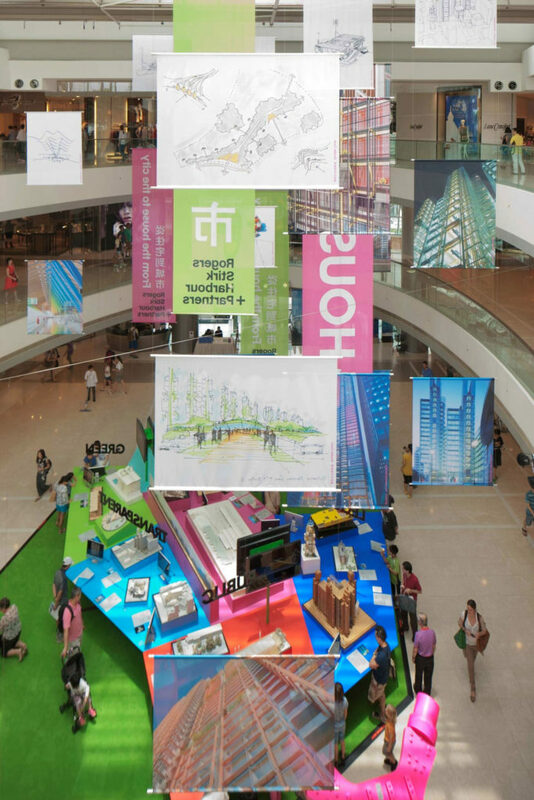 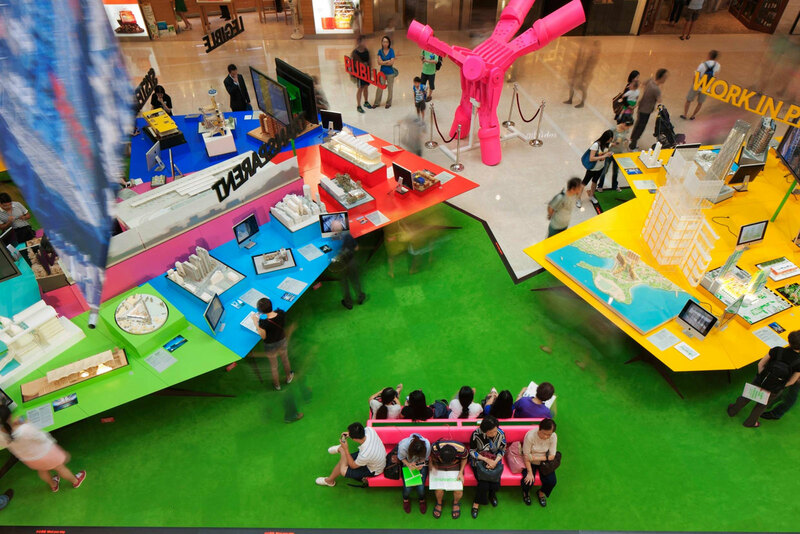 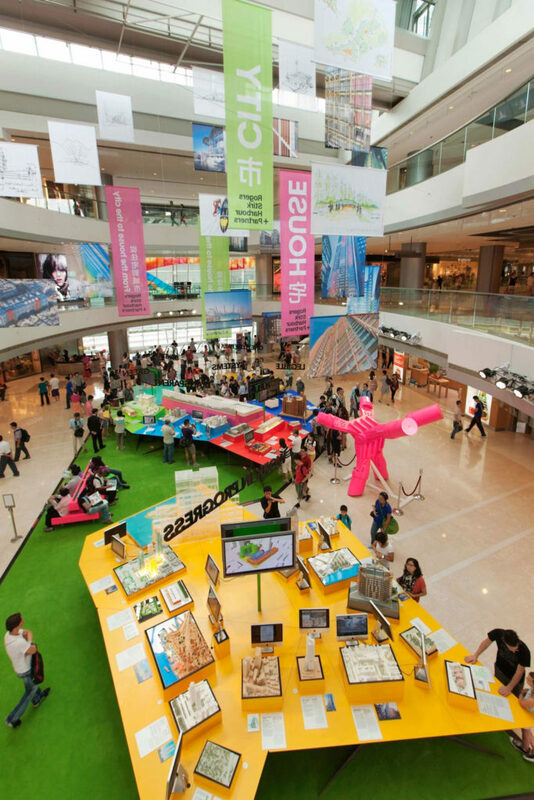 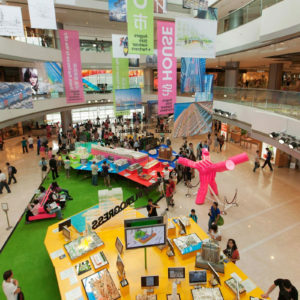 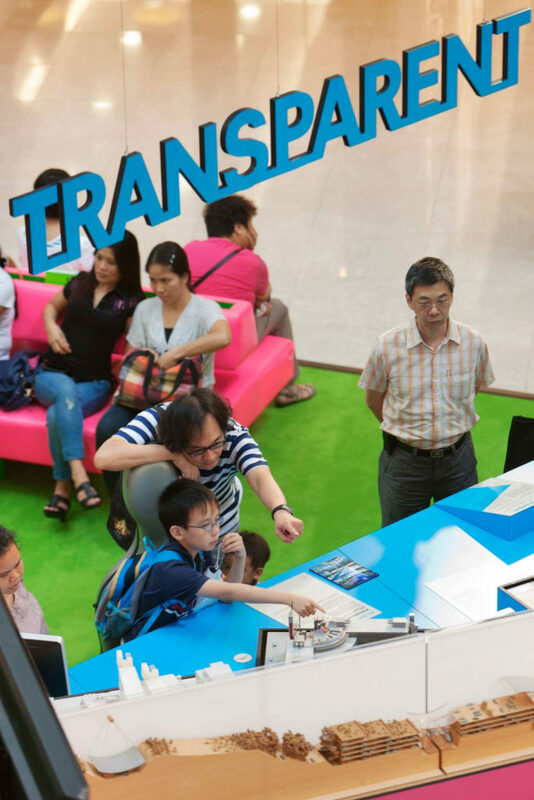 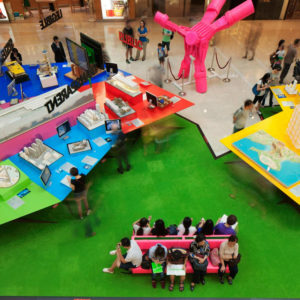 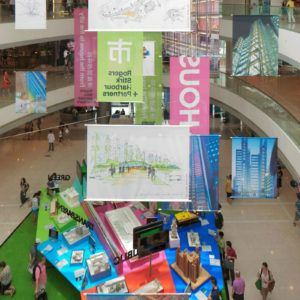 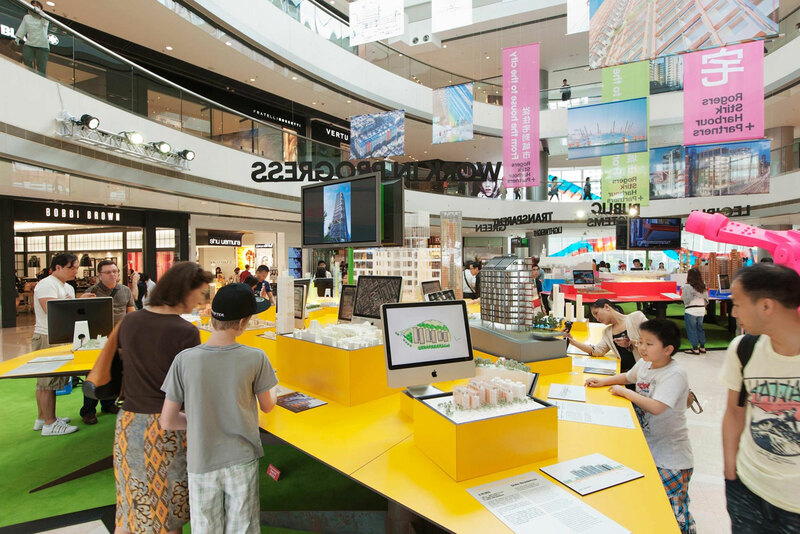 At each venue our design for the exhibition was adapted to respond to the conditions through reconfiguration of the established components and introduction of site-specific features – such as a 20 metre vertical timeline in the IFC Mall, Hong Kong.